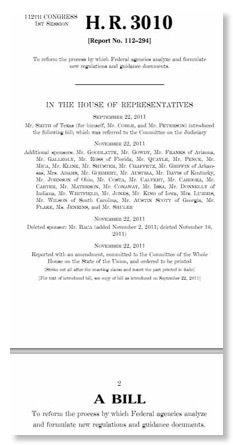 “Regulatory Accountability Act of 2011 - Amends the Administrative Procedure Act to revise and expand the requirements for federal agency rulemaking by requiring agencies, in making a rule, to base all preliminary and final determinations on evidence and to consider the legal authority under which the rule may be proposed, the specific nature and significance of the problem the agency may address with the rule, any reasonable alternatives for the rule, and the potential costs and benefits associated with such alternatives. Requires agencies to publish advance notice of proposed rulemaking for major rules and for high-impact rules (rules having an annual cost on the economy of $100 million or $1 billion or more, respectively), which shall include a written statement identifying the nature and significance of the problem the agency may address with a rule, the legal authority under which the rule may be proposed, and a solicitation for written data and comments from interested persons. Sets forth criteria for issuing major guidance (agency guidance that is likely to lead to an annual cost on the economy of $100 million or more, a major increase in cost or prices, or significant adverse effects on competition, employment, investment, productivity, innovation, or ability to compete). Expands the scope of judicial review of agency rulemaking by allowing immediate review of rulemaking not in compliance with notice requirements and establishing a substantial evidence standard for affirming agency rulemaking decisions. Thus the basic presumption of RAA is that ALL federal regulations add new burdens on industry and that Congress needs to make a major change to the 1946 Administrative Procedures Act to slow new regulations. While this is certainly true for many regulations from many agencies and also the reason why EPA is called by some the “employment prevention agency”, new FCC Title III technical regulations almost always have the impact of allowing for the first time new technologies and new products and contributing to economic growth and national competitiveness. RAA would subject FCC to the provisions of Clinton-era EO 12866 including OMB review of new rules. It would also expands the grounds for judicial review - another sure way to slow down innovation. Lazarus ends with the recommendation that to speed wireless innovation FCC should have an exemption from the Administrative Procedures Act burdens that have accumulation in 65 years of case law and only be bound by the original statutory provisions. The RAA is above in the opposite direction and may well worsen the existing gridlock on innovative technology. Perhaps the provisions of RAA would be helpful at most other agencies and maybe even in much of FCC’s jurisdiction. But their application to technical Title III rule makings at FCC could have a disastrous implication for technical innovation and national competitiveness. Of course, broadcast and cellular incumbents are the “haves” today and might welcome a slowdown in technical innovation that might encroach on their spectrum. Readers who think this might be reasonable are encouraged to read the previous blog entry about Ofcom’s CEO’s views on innovation and its impact. But to say something good about RAA, § 553(f)(2) has the following provision that could help consideration of technical issues at FCC:‘‘The agency shall adopt a rule only on the basis of the best reasonably obtainable scientific, technical, economic, and other evidence and information concerning the need for, consequences of, and alternatives to the rule.” Of course, NTIA is subject to similar terms under existing Executive Branch policy on scientific integrity and it is not clear if they have had much impact there.